ZTHY 65W Charger - Compatible models】lenovo yoga 4 pro, yoga 3-1470 for core i5 i7, yoga 900 900-13isk 900-13isk2, and also compatible yoga 3, yoga 700 11 14for Core i3 i5, yoga 900s, Miix 700, Yoga 920, Yoga 14 Tablet. Model: adl65WLA. Specifications: output Voltage: 20V Output Current: 3. 25a output power: 65w input voltage: ac100-240v dc tip: special irregular usb port color: black compatiable models: lenovo ideapad 700s: 700s-14isk lenovo yoga 900: 900-13isk 900-13isk2 lenovo ideapad miix 710: 710-12ikb 710-12ikb lte lenovo yoga 900s: 900s-12isk 80ml000mus 80ml000nus 80ml000pus 80ml000qus lenovo yoga 700 11 14: 80qe0044us 80qe000jus 80qe000lus 80qe000nus 80qd00b0us 80qd004nus 80qd003yus 80qd00drus lenovo ideapad miix 700: 700-12isk 80ql0000us 80ql0009us 80ql0008us 80ql000bus 80ql0001us 80ql0004us 80ql000aus 80ql000cus 80ql0020us 80ql005nus lenovo yoga 3 11: 1170 80j80021us 80j8002mus 80j8002tus 80j8002uus 80j8002vus 80j8002xus 80j8002yus lenovo yoga 3 14: 1470 80jh000rus 80jh000pus 80jh000sus 80jh000uus 80jh000vus 80jh000wus 80jh0025us 80jh00flus 80jh00llus 80jh00lmus 80jh00lnus 80jh00lpus 80jh00lrus 80jh00lsus lenovo yoga 3 pro: 1370 80he010kus 80he011xus 80he00fvus 80he00fxus 80he00fyus 80he00g1us 80he00g2us 80he00g4us 80he00gkus 80he000hus 80he000lus 80he0043us 80he0047us 80he0048us 80he0049us 80he000dus 80he0033us 80he00DVUS 80HE00DWUS 80HE00F5US 80HE010EUS 80JH00LJUS 80HE010HUS 80HE010FUS 80HE010GUS 80HE010JUS 80HE011WUS Note: Not fit for Lenovo Yoga 700 14 for Core i7 Model Please make sure if this charger suit for your laptop or not before place an order. Ctrl/" + /"f/" to find your models If you can not make sure that, please contact with us freely. Zthy adapter charger return policy】 rest assured with 30 days Refund and 12 months Replacement, also get our friendly customer service. Package includes: 1 x 20V 3. 25a 65w ac laptop adapter Power Supply Charger. VUOHOEG - Please use "ctrl"+"f" to find your laptop model/part laptop model printed on your laptop bottom or original battery. Item specification: Type: Li-ionVoltage: 7. 6v capacity: 66wh / 8400mahcolor: blackcondition: new compatible model: for lenovo yoga 4 pro yoga 900 for lenovo yoga 900-13iskfor lenovo yoga 900-ifI For Lenovo YOGA 900-ISE Compatible P/N: L14L4P24L14M4P245B10H43261 Battery type: li-ion; voltage: 7. 6v; capacity: 66wh, 8400mAh;Color:Black. Fits model: for lenovo yoga 900 900-13isk 900-ise 900-IFI, Yoga 4 Pro Laptop. Compatible part number: l14l4p24 l14M4P24 5B10H43261. Durable safety High Performance Battery. Our service: focus on providing quality power products and Excellent Customer Service, 24 x 7 Email Support and12 Months warranty, 30 Days Money Back Guarantee! Superer SP200325UZ - Package includes:1 x AC Charger, 1 X Charging Cable. The standard usb port can also be used to charge other devices like a smartphone or tablet. Warranty: 30 days money Back Guarantee/12 Months Warranty. Fits model: for lenovo yoga 900 900-13isk 900-ise 900-IFI, Yoga 4 Pro Laptop. Compatible part number: l14l4p24 l14M4P24 5B10H43261. Durable safety High Performance Battery. Our service: focus on providing quality power products and Excellent Customer Service, 24 x 7 Email Support and12 Months warranty, 30 Days Money Back Guarantee! Fit for lenovo yoga 700 700-11isk 700-14isk 80qd 80qe, yoga 900 900-13isk 900-13isk2 yoga 4 pro 80MK 80UE Laptop Battery type: li-ion; voltage: 7. 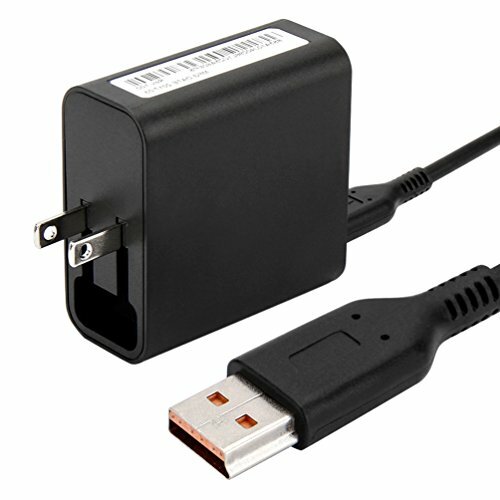 AC Charger for Lenovo Yoga 700 700-11ISK 700-14ISK 80QD 80QE, Yoga 900 900-13ISK 900-13ISK2 Yoga 4 Pro 80MK 80UE Laptop with USB Cable Power Supply Adapter Cord - 6v; capacity: 66wh, 8400mAh;Color:Black. Fit for lenovo yoga 700 700-11isk 700-14isk 80qd 80qe, yoga 900 900-13isk 900-13isk2 yoga 4 Pro 80MK 80UE Laptop. Output:20v 3. 25a or 5. 2v 2a 65w input:100-240V 50-60Hz. Superer SP200325UZ - Fit for lenovo yoga 900 900-13isk 900-13isk2 yoga 700 700-11isk 700-14isk yoga 3 pro 1370 1470 1170 yoga 4 pro 80mk 80ue 80qd 80qe 80jh 80he; p/n: adl40wcc adl40wdb adl40wda adl40wdd adl40wde adl40wdc adl40wlc adl40wcd adl40wcg adl65wcc gx20h34904 GX20K15992 Battery type: li-ion; voltage: 7. 6v; capacity: 66wh, 8400mAh;Color:Black. Package includes:1 x AC Charger, 1 X Charging Cable. Output:20v 3. 25a or 5. 2v 2a 65w input:100-240V 50-60Hz. The standard usb port can also be used to charge other devices like a smartphone or tablet. Warranty: 30 days money Back Guarantee/12 Months Warranty. Fit for lenovo yoga 700 700-11isk 700-14isk 80qd 80qe, yoga 900 900-13isk 900-13isk2 yoga 4 Pro 80MK 80UE Laptop. AC Charger for Lenovo Yoga 900 900-13ISK 900-13ISK2 Yoga 700 700-11ISK 700-14ISK Yoga 3 Pro 1370 1470 1170 Yoga 4 Pro 80MK 80UE 80QD 80QE 80JH 80HE Laptop with Charging Cable Power Supply Adapter Cord - Output:20v 3. 25a or 5. 2v 2a 65w input:100-240V 50-60Hz. Warranty: 30 days money Back Guarantee/12 Months Warranty. Package includes:1 x AC Charger, 1 X Charging Cable. The standard usb port can also be used to charge other devices like a smartphone or tablet. Lenovo Direct GX20H34904 - It is highly energy efficient and is backed by a 1-year warranty. Lenovo ac adapters are compact, energy efficient and backed by a 1 year warranty. Keep one in the office, one at home, and another in your carrying case for convenient access to power. Slim-tip design connects securely to your Lenovo notebook. Battery type: li-ion; voltage: 7. 6v; capacity: 66wh, 8400mAh;Color:Black. Fit for lenovo yoga 900 900-13isk 900-13isk2 yoga 700 700-11isk 700-14isk yoga 3 pro 1370 1470 1170 yoga 4 pro 80mk 80ue 80qd 80qe 80jh 80he; p/n: adl40wcc adl40wdb adl40wda adl40wdd adl40wde adl40wdc adl40wlc adl40wcd adl40wcg adl65WCC GX20H34904 GX20K15992. Slim Travel AC Adapter GX20H34904 - Lenovo 40W Computer Charger - Warranty: 30 days money Back Guarantee/12 Months Warranty. Fit for lenovo yoga 700 700-11isk 700-14isk 80qd 80qe, yoga 900 900-13isk 900-13isk2 yoga 4 Pro 80MK 80UE Laptop. The standard usb port can also be used to charge other devices like a smartphone or tablet. Output:20v 3. 25a or 5. 2v 2a 65w input:100-240V 50-60Hz. Warranty: 30 days money Back Guarantee/12 Months Warranty. Fits model: for lenovo yoga 900 900-13isk 900-ise 900-IFI, Yoga 4 Pro Laptop. STARTECH.COM ST1000BT32 - Lenovo ac adapters are compact, energy efficient and backed by a 1 year warranty. Keep one in the office, one at home, and another in your carrying case for convenient access to power. Slim-tip design connects securely to your Lenovo notebook. Card. Output:20v 3. 25a or 5. 2v 2a 65w input:100-240V 50-60Hz. Fit for lenovo yoga 900 900-13isk 900-13isk2 yoga 700 700-11isk 700-14isk yoga 3 pro 1370 1470 1170 yoga 4 pro 80mk 80ue 80qd 80qe 80jh 80he; p/n: adl40wcc adl40wdb adl40wda adl40wdd adl40wde adl40wdc adl40wlc adl40wcd adl40wcg adl65WCC GX20H34904 GX20K15992. Pci-based 10/100/1000 mbps gigabit Ethernet Network Adapter Card. Compatible with ieee 802. 3, 802. 3u, 802. 3ab and 802. 3x standards. Operating systems, 7, vista-64bit, 2000, xp, windows 98se, XP-64bit, mE, including linux, Vista, 7-64bit and Mac OSX. Suitable for any pci-enabled client, server or workstation, the gigabit Ethernet Network Adapter Card supports high performance dual channel networking and maximum data transfer speeds of 1000Mbps in each direction 2000 Mbps total - up to ten times faster than 10/100 Ethernet. 1 Port PCI 10/100/1000 32 Bit Gigabit Ethernet Network Adapter Card - Compatible with yoga 900s, yoga 700 14" with integrated graphics; Yoga 700 11"; ideapad 700s 14"; Miix 700 Fit for lenovo yoga 700 700-11isk 700-14isk 80qd 80qe, yoga 900 900-13isk 900-13isk2 yoga 4 Pro 80MK 80UE Laptop. Dell Computers - Fit for lenovo yoga 900 900-13isk 900-13isk2 yoga 700 700-11isk 700-14isk yoga 3 pro 1370 1470 1170 yoga 4 pro 80mk 80ue 80qd 80qe 80jh 80he; p/n: adl40wcc adl40wdb adl40wda adl40wdd adl40wde adl40wdc adl40wlc adl40wcd adl40wcg adl65WCC GX20H34904 GX20K15992. Fits model: for lenovo yoga 900 900-13isk 900-ise 900-IFI, Yoga 4 Pro Laptop. Compatible part number: l14l4p24 l14M4P24 5B10H43261. Durable safety High Performance Battery. Our service: focus on providing quality power products and Excellent Customer Service, 24 x 7 Email Support and12 Months warranty, 30 Days Money Back Guarantee! The standard usb port can also be used to charge other devices like a smartphone or tablet. Dell Original 65W Thin Laptop Charger for Inspiron 15 Series Power-Supply-Cord Original Version - . Compatible only with selected models: inspiron 15 3555 3558 3559 3565 3567 3568 5551 5552 5555 5558 5559 5565 5567 5568 5578 7560 7569 7579. Warranty: 30 days money Back Guarantee/12 Months Warranty. Output:20v 3. 25a or 5. 2v 2a 65w input:100-240V 50-60Hz. Package includes:1 x AC Charger, 1 X Charging Cable. Pci-based 10/100/1000 mbps gigabit Ethernet Network Adapter Card. Superer GA200020 - Warranty: 30 days money Back Guarantee/12 Months Warranty. Output:20v 3. 25a or 5. 2v 2a 65w input:100-240V 50-60Hz. Output:20v 3. 25a or 5. 2v 2a 65w input:100-240V 50-60Hz. The standard usb port can also be used to charge other devices like a smartphone or tablet. The standard usb port can also be used to charge other devices like a smartphone or tablet. Package includes:1 x AC Charger, 1 X Charging Cable. Package include: 1 X USB Charge Cable. Lenovo yoga 3 4 pro 80jh 80he 3-1370 3-1470 3-1170 pro-1370, yoga 700 700-11isk 700-14isk 700-11 700-14 700-111sk 700-141sk 80qd 80qe, yoga 900 900-13isk 900-13isk2 900-13 900-131sk 80mk 80ue, yoga 3-1470 3-1370 3-1170 pro-1370, yoga 3 11 14 1370 1470 1170, yoga3 11-5y10 14-ifi 11-5y10 5l60j33144 5l60J33145 145500119 145500121. 5.9Ft1.8m USB Charger Power Cable for Lenovo Yoga 3 4 Pro 1370 11 14 Yoga 700 900 700-11 900-13, Yoga 3-1470 3-1370 3-1170 Pro-1370 Yoga3 11-5Y10 14-IFI 11-5Y10 Laptop Charging 5L60J33144 5L60J33145 - Cable length: 5. 9ft/1. 8m. Fit for lenovo yoga 900 900-13isk 900-13isk2 yoga 700 700-11isk 700-14isk yoga 3 pro 1370 1470 1170 yoga 4 pro 80mk 80ue 80qd 80qe 80jh 80he; p/n: adl40wcc adl40wdb adl40wda adl40wdd adl40wde adl40wdc adl40wlc adl40wcd adl40wcg adl65WCC GX20H34904 GX20K15992. Compatible only with selected models: inspiron 15 3555 3558 3559 3565 3567 3568 5551 5552 5555 5558 5559 5565 5567 5568 5578 7560 7569 7579. Package includes:1 x AC Charger, 1 X Charging Cable. Warranty: 30 days money Back Guarantee/12 Months Warranty. KINGDO ADL40WDA - Kingdo yoga power supply 40W 20V 2A or 5. 2v 2a compatibility: lenovo yoga 3 pro, i5 yoga 3 11, i5, i7 yoga 3 14, yoga 3-1170 for core i3, yoga 3-1470 only for core i3 lenovo miix 700, Yoga 3 Pro-1370 Only for Core i3, Miix Tablet 700 Pro 700-12ISK Pro Lenovo ideapad 700s 14" Not all model listed here. Package includes:1 x AC Charger, 1 X Charging Cable. Fits model: for lenovo yoga 900 900-13isk 900-ise 900-IFI, Yoga 4 Pro Laptop. Compatible part number: l14l4p24 l14M4P24 5B10H43261. Durable safety High Performance Battery. Our service: focus on providing quality power products and Excellent Customer Service, 24 x 7 Email Support and12 Months warranty, 30 Days Money Back Guarantee! KINGDO Yoga Power Supply Adapter Charger 40W 20V 2A or 5.2V 2A for Lenovo Yoga 3 Pro Convertible Ultrabook Tablet with 6.7Ft Power Cord Including a Carrying Pouch - Fit for lenovo adapter pn: adl40wdd adl40wda adl40wdj adl40wdg adl40wdb adl40wdc adl40wde adl40wca adl40wcb 80he0049us adl40wcc adl40wcd adl40wce adl40wcf gx20h34904 adl40wcg adl40wle adl40wlf adl40wch adl40wdh adl40wdh adl40wla adl40wlb adl40wlc adl40wld adl65wda adl65wdj adl65wdb adl65wdd adl65wdg adl65wde adl65wdc adl65wdh adl65wla adl65wlb adl65wlc adl65wld adl65wle adl65wlf aDL65WLG ADL65WLH. Compatible only with selected models: inspiron 15 3555 3558 3559 3565 3567 3568 5551 5552 5555 5558 5559 5565 5567 5568 5578 7560 7569 7579. The standard usb port can also be used to charge other devices like a smartphone or tablet. Package include: 1 X USB Charge Cable. Fit for lenovo yoga 700 700-11isk 700-14isk 80qd 80qe, yoga 900 900-13isk 900-13isk2 yoga 4 Pro 80MK 80UE Laptop. Kingdo 40w 20v 2a or 5. ZOZOPlus - Lenovo yoga 3 4 pro 80jh 80he 3-1370 3-1470 3-1170 pro-1370, yoga 3 11 14 1370 1470 1170, yoga 700 700-11isk 700-14isk 700-11 700-14 700-111sk 700-141sk 80qd 80qe, yoga 3-1470 3-1370 3-1170 pro-1370, yoga 900 900-13isk 900-13isk2 900-13 900-131sk 80mk 80ue, yoga3 11-5y10 14-ifi 11-5y10 5l60j33144 5l60J33145 145500119 145500121. Cable length: 5. 9ft/1. 8m. Kingdo 40w 20v 2a or 5. 2v 2a power Supply quickly recharges the battery. Input: 100-240v~1. 7a 50~60hz; output:40w 20v 2a or 40W 5. 2v 2a. Model:adl40wda, come with 6. 7ft power cord and a carrying pouch bag. 1 year warranty with Replacement Coverage. Usb charge cable for yoga 3 pro, yoga 3 11, yoga3 14-ifi, yoga 3-1470, yoga3 11-5y10, Yoga3 11-5Y10, yoga 3 14, Yoga 3-1470. ZOZO Extra Long 8.2ft 2.5m USB Cable of Ac Adapter Charger Power Supply for Lenovo Yoga 3 Pro, Yoga 3 11, Yoga 3 14, Yoga 3-1470, Yoga3 11-5Y10, Yoga3 14-IFI, Yoga3 11-5Y10, Yoga 3-1470 Yoga 900 - Longer than oem one cable length: 8. 2ft/2. 5m, enough length for charging, don't need to sit beside the charger while playing computer. Fit for lenovo yoga 900 900-13isk 900-13isk2 yoga 700 700-11isk 700-14isk yoga 3 pro 1370 1470 1170 yoga 4 pro 80mk 80ue 80qd 80qe 80jh 80he; p/n: adl40wcc adl40wdb adl40wda adl40wdd adl40wde adl40wdc adl40wlc adl40wcd adl40wcg adl65WCC GX20H34904 GX20K15992. Lenovo (United States), Inc. GX20K15992 - The standard usb port can also be used to charge other devices like a smartphone or tablet. Pci-based 10/100/1000 mbps gigabit Ethernet Network Adapter Card. Compatible with ieee 802. 3, 802. 3u, 802. 3ab and 802. 3x standards. Operating systems, xp, 2000, including linux, vista-64bit, mE, 7, Vista, windows 98se, XP-64bit, 7-64bit and Mac OSX. Dell inspiron 15 Laptop Compatible Charger 65w. Package includes: 1 x zozo 8. 2ft yoga 3 pro USB Cable. Lenovo ac adapters are compact, energy efficient and backed by a 1 Year Warranty. Any problems, please contact us before returning. Compatible only with selected models: inspiron 15 3555 3558 3559 3565 3567 3568 5551 5552 5555 5558 5559 5565 5567 5568 5578 7560 7569 7579. Lenovo 65W Slim Travel AC Adapter, Black GX20K15992 - Package includes:1 x AC Charger, 1 X Charging Cable. Compatible with the yoga 900 and yoga 700 14" with discrete Graphics. Output:20v 3. 25a or 5. 2v 2a 65w input:100-240V 50-60Hz. Battery type: li-ion; voltage: 7.